Graduate of the music education department of Musashino Academia Musicae with a piano major, Kumiko Takahashi actively composes not only in the classical genre, but for traditional Japanese music, theater and film in Japan and overseas. 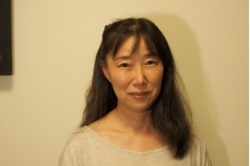 She has studied composition under Tsuneya Tanabe. When it comes to writing for traditional Japanese instruments, she has a distinct style of familiarizing herself with and learning how to play the instrument before writing for it. So far she has learned the koto, shamisen, shakuhachi, biwa, hichriki, sho, noh flute, large and small tsuzumi and noh singing. In 2015, Kumiko launched a CD series that crosses musical boundaries, creating a new musical realm by working with artists from both Western and Japanese musical genres. The first was a collaboration with koto performer Soju Nosaka, titled “Kumiko Takahashi meets Soju Nosaka: New Compositions for Koto”. She is the artistic director of the Hōgaku Composers Alliance, and member of the Pro Musica Nipponia. Keiko Aoyama graduated from the Tokyo University of the Arts in 1987, and was the first vocalist to receive a doctorate in Japan. Her thesis was titled “Practical Research on Vocal Techniques Used in Japanese Art Song - The Applicability of Traditional Japanese Vocal Genres -”. 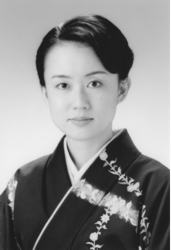 After graduating, Keiko continued to investigate how to marry the Western classical singing tradition with Japanese traditional singing techniques, and has performed an extensive range of compositions, including works with song and narration accompanied by traditional Japanese instruments and mono operas. 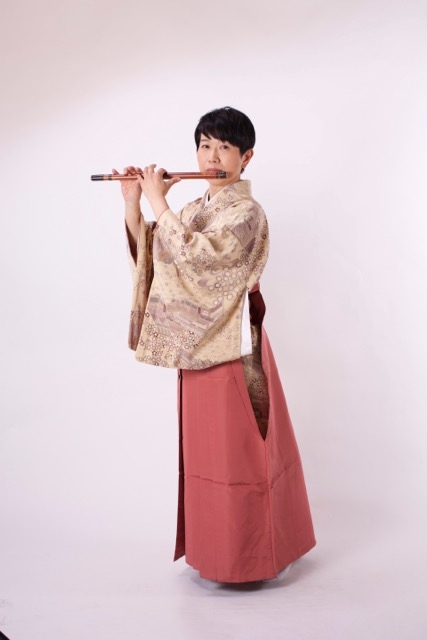 In recent years, Keiko has been holding concerts showcasing new works based on ancient and classical Japanese texts such as “Kojiki”, Matsuo Basho’s “Oku no Hosomichi (Narrow Road)”, “Manyoshu” and works by Yakumo Koizumi. Some of the operatic works she performed during this time include “Asajigayado” and “The Little Prince”, performed by the Tokyo Chamber Opera Theater. In 2008 she was in Kosaku Yamada’s opera “Black Ships” as Omatsu at the New National Theater Tokyo, and in February 2011 she was the first vocalist to be invited to the music festival “Music from Japan” held in New York. Keiko received 1st prize at the First Japanese Song Competition held by Fumiko Yotsuya and NAMI NO KAI in 1975, and the Concert Performance Prize from the Music Pen Club in 1998. 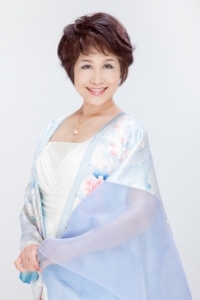 She is currently a member of the Tokyo Chamber Opera Theater, and an honorary member of NAMI NO KAI Nihon Kakyoku Association. Ko Ishikawa began his career as a sho player in 1990, and has since performed in music festivals all over Japan and across the globe. He is a member of the gagaku organization Reigakusha, where he has performed many traditional and contemporary compositions, and has also established his own musical realm as a solo performer with various musicians and composers. Ko is also highly acclaimed for his singing in the gagaku tradition, such as saibara (folk songs arranged for gagaku). As an educator, Ko has been teaching at Wako University, Gakushuin University, Okinawa Prefectural University of Arts and Kyushu University. under Yukio Tanaka. She completed the NHK Hogaku Training Program at the top of the 43rd class, and has received 1st prize at the 39th Japanese Biwa Music Competition, the Ministry of Education Award for Fine Arts and the NHK Award at the 39th National Biwa Music Competition in Japan. She has performed with many orchestras including the Sagamihara Chamber Orchestra and the Kyoto City Symphony Orchestra conducted by Hiroyuki Iwaki, the Kanagawa Philharmonic Orchestra conducted by Masahiko Enkoji, the BBC Symphony Orchestra and the Barcelona Symphony Orchestra conducted by Kazushi Ono, Orchestre National de Lyon conducted by Eivind Gullberg Jensen, the Kyoto Symphony Orchestra conducted by Junichi Hirokami, and performed Toru Takemitsu’s “November Steps” with Kifu Mitsuhashi and the Prague Radio Symphony Orchestra, conducted by Marko Ivanovic. She has also performed in concerts produced by the National Theater of Japan, as well as media appearances including “Hogaku no Hitotoki” on NHK national radio and “Geino Hana Butai”, an NHK television program showcasing young upcoming artists in the traditional Japanese music scene. Kumiko performs in many concerts overseas as well as performing regularly in Japan. Meanwhile, she has also performed improvisation with such distinctive musicians as Stomu Yamash’ta (percussion), Haruna Miyake (composition, piano), Genzoh Takehisa (keyboard instruments), Shonosuke Okura (otsuzumi) and Leo Tadagawa (Jew’s harp). Currently, she is researching Yatsuhashi-ryu (the style of koto which precedes the current two main styles of koto, Ikuta-ryu and Yamada-ryu), by studying literature from the Edo Period. 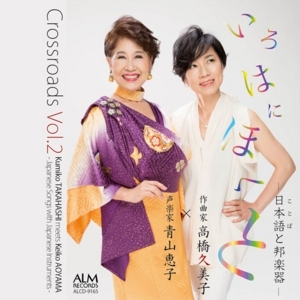 Her most prominent CD releases include “Memoirs of Memory II” and “Traditional Koto Music on Tasuke-so with Silk Strings”. Her playing can also often be heard in a variety of film and television music. Honjoh Hidejiro was born with the name Keigo Ayusawa in the city of Utsunomiya, Tochigi Prefecture. He learned contemporary repertoire from Honjoh Hidetaro, the head of the Honjoh School, and was later given the stage name Honjoh Hidejiro. Hidejiro studied under the late Katsuyoshiju Kineya while he was a student at Toho Gakuen College of Drama and Music, where he specialized in modern music for the shamisen. He has also studied tsugaru shamisen with Yusho Hasegawa. In 2015 he was selected as an ACC Kimpei Nakamura Fellow to study in New York. His performance has been described by the late theater director Yukio Ninagawa as “sensitive yet strongly intense, and raises deep emotions in the listener”. Hidejiro has received 1st prize at the Kumamoto National Hogaku Competition, the Minister of Education Award for Fine Arts, the Agency for Cultural Affairs Award for upcoming artists for his concert in tribute to shamisen performer Kazuko Takada, the Idemitsu Music Prize, the Utsunomiya Espérer Award, and was selected to be part of the “B to C Recital Series” held by the Tokyo Opera City Cultural Foundation. 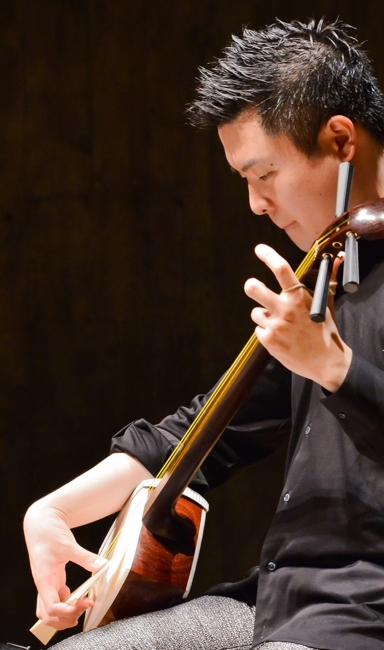 By continually commissioning new works, he pursues new shamisen music for the next generation. So far he has held four solo recitals, and he is also a part time lecturer at the Toho Gakuen College of Drama and Music. 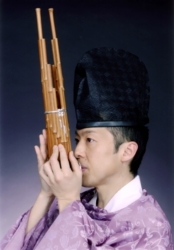 A master of a number of traditional Japanese transverse flutes, Kei Matsuo plays in contemporary ensembles for traditional Japanese instruments, gagaku and Japanese folk music, as well as in solo contexts. In addition to collaborating with traditional Japanese instruments such as koto, shamisen and biwa, Kei branches out and collaborates with many different Western instruments, folk instruments and dancers from all over the world. Kei studied the nohkan under Hiroyuki Matsuda of the nohgaku Morita School, and studied ryuteki, komabue and kagurabue under Naoko Miyamaru of Reigakusha. She first learned the shinobue from Mitsuko Nakabayashi, then studied classical, contemporary and folk repertoire from Makoto Takei, Hiroyuki Koinuma and Jiro Murayama. Koto performer Tsugumi Yamamoto has completed the 39th class of the NHK Hogaku Training Program, and studied the twenty-five string koto under Soju Nosaka for one year when she was selected for the Japanese Government Agency for Cultural Affairs Overseas Study Program for Upcoming Artists. 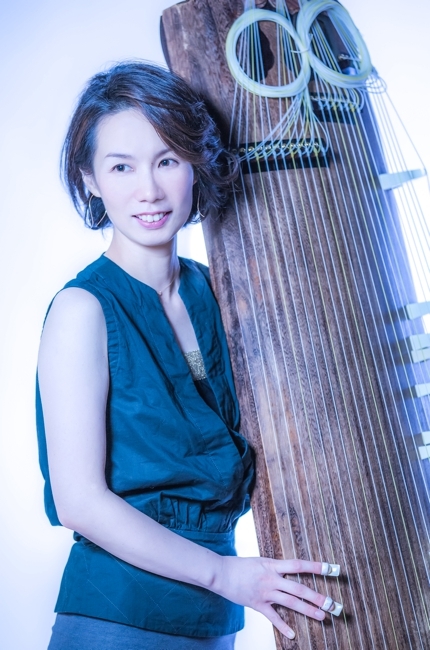 Tsugumi has been performing predominantly as a twenty-five string koto artist since she was drawn to the vast potential in expression of the instrument. Among her numerous performances supported by the Japan Foundation is a multi-media project “Strings & Serpents”, involving a British/French piano duo with the koto along with visual projections, which has toured across North America. In 2016 she released a solo album of works for twenty-five string koto “Tsumugu – Spinning the Thread”, which includes pieces by Kumiko Takahashi, Aki Mori and Kazuyuki Taguchi.